Mold and Fungi can be found in Bend Oregon homes. It can be found almost everywhere, both indoors and out, molds and fungi are simple organisms. Micro fungi are only visible through a microscope. Plaster and wood-rotting fungi are known as macro fungi because they produce sporing bodies that are visible to the naked eye. Molds and mildews are names given to thousands of species of filamentous fungi. Molds have clusters of spores that are located on the end of tiny stalks. Spores are the reproductive products of the mature mold. The web-like body called mycelium attaches to porous surfaces. Mycelia and spores may contain chemical compounds, some of which can be poisonous and toxic to humans, and they can create a large range of health problems, depending on the exposure and tolerance of the individual. Spores pose a larger health concern because they become airborne and can be inhaled. Most molds and fungi do not cause humans any health problems. Found on plants, foods, dry leaves, and other organic material, molds perform a valuable function by assisting in breaking down dead material. Mold spores are very tiny and lightweight, allowing them to travel freely through the air. Other types of mold colonize as a network of filaments by attaching themselves to host material. Molds that have a food source and adequate moisture will grow in an indoor environment, even in arid climates. Evidence of mold can be seen in the form of discoloration ranging from white-to-orange and from green-to-brown-to-black growing on various materials found inside and outside the house. As noted earlier, molds and fungi are found everywhere, both outdoors and indoors. Much of the mold found indoors comes from outdoor sources. Therefore, everyone is exposed to some mold on a daily basis, usually without ill health effects. Ill health effects from fungi usually depend on the dose and duration of exposure to the mold source. The methods of exposure are inhalation, exposure to skin, and ingestion. Inhalation - Since mold spores can be airborne, exposure can occur through the lungs. Mold spores get into a house through windows, doors, cracks, and crevices. They also can be carried into a house from the outdoors on shoes and clothing, or on numerous other objects that may be brought home. 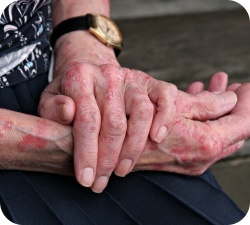 Skin - Some humans experience skin irritation if their skin touches a moldy surface, noted by localized redness or swelling. 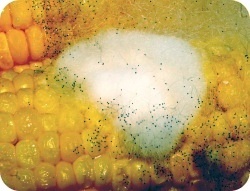 Ingestion - A number of toxic fungal species can be found on spoiled food and agricultural products. These toxins can cause serious food poisoning. In some cases, severe liver damage or death can result. Infections: May be either localized internal or external infections. These infections are treated with drugs that target the specific area of the body where the infection resides. Often, external infections will lead to an inflammatory condition of the skin characterized by redness, itching, and oozing vesicular lesions that become scaly, crusted, or hardened. Respiratory Problems: Includes difficulties in breathing, a dry hacking cough, chest tightness, shortness of breath, and wheezing. Existing conditions, such as those relating to hay fever and asthma, can be severely aggravated by fungi exposure. Exposure can also lead to hypersensitivity pneumonitis, which is a form of lung disease characterized by inflammation of the lung tissue. Nasal Passage Problems: Includes nasal and sinus congestion and nose and throat irritation. In some cases, nosebleeds may occur. Eye Problems: Watery, burning, or reddened eyes. In some cases, vision may become blurred and the eyes become extremely light sensitive. Central Nervous System Problems: Memory and verbal problems, vertigo, dizziness, depression, malaise, mood changes or constant headaches. Possible Death - In some extreme cases of exposure to extremely toxic fungi and mycotoxins, death can result. Death, however, is usually due to the toxin attacking a vital organ such as the liver or heart. Persons with immune compromised systems such as people with HIV, liver diseases, organ transplants, those undergoing chemotherapy, etc.